It's very important that motorists know how to safely share the roads with Luas trams. If they don't they could be prosecuted and they could seriously injure or kill themselves and others. When driving across Luas lines at Junctions, beside Luas Tram Lanes on the road or in Luas Shared Tramways we want motorists to drive safely. Below we have outlined safety information for motorists for the 3 types of Luas track areas; each of which has its own rules and safety tips. Ireland's first automated Red Light Camera System located at the junction of Blackhall Place and the Luas Red Line / Benburb Street. It is a driving offence to break red lights at any junction and this system captures images of motorists breaking red lights, their licence plate numbers and other data allowing An Garda Siochana to pursue offenders under the Road Traffic Acts. 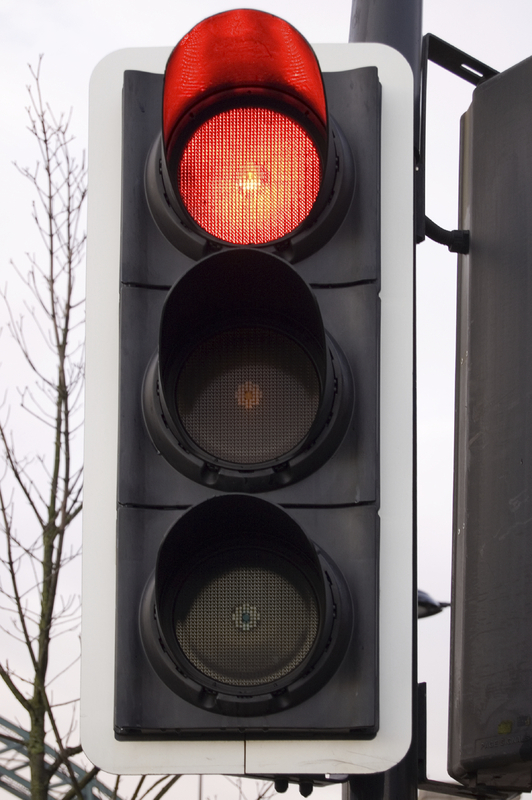 Breaking red lights carries 3 penalty points and a fine of up to €120 on payment of the fixed charge. On court conviction the number of penalty points awarded increases to 5. This Red Light Camera System and other initiatives are part of ongoing #LuasSafety efforts to prevent Luas-Vehicle collisions. To prevent collisions it's very important that motorists know how to safely share the road with Luas trams. Read on to find out more. There are over 37km of Luas tram lines in Dublin. 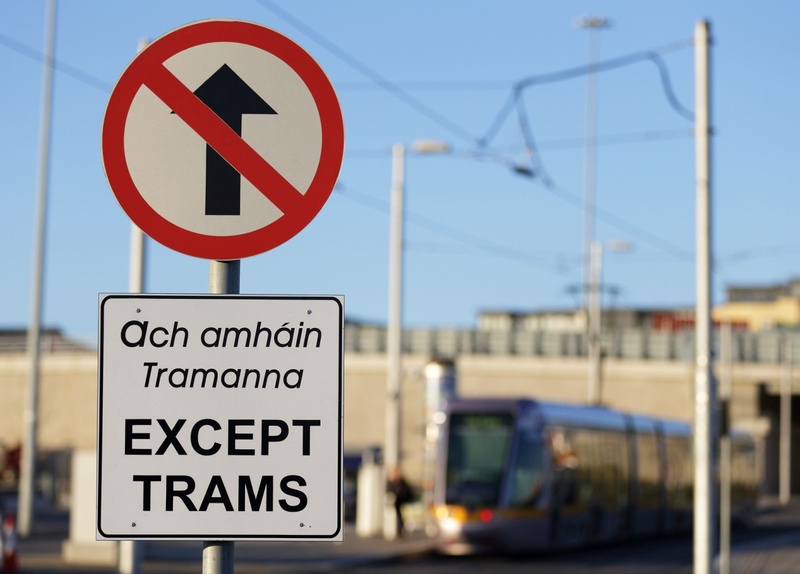 Tram Lanes make up 91% of the Luas tracks. Road vehicles are not allowed in Tram Lanes; Tram Lanes are dedicated areas for trams only. All Tram Lanes are clearly identified by warning signs at the start of the segregated sections. The Tram Lanes being delineated by a continuous white line. It is a contravention of the Irish road traffic legislation to drive in Tram Lanes and you could be prosecuted. Irish road traffic legislation can be accessed at the website of the Office of the Attorney General of Ireland which contains a searchable database. Irish road traffic legislation is also summarised on the Department of Transport, Tourism & Sport's website Department. There are over 37km of Luas tram lines in Dublin. Together Junctions and Shared Tramways make up 9% of the Luas tracks. 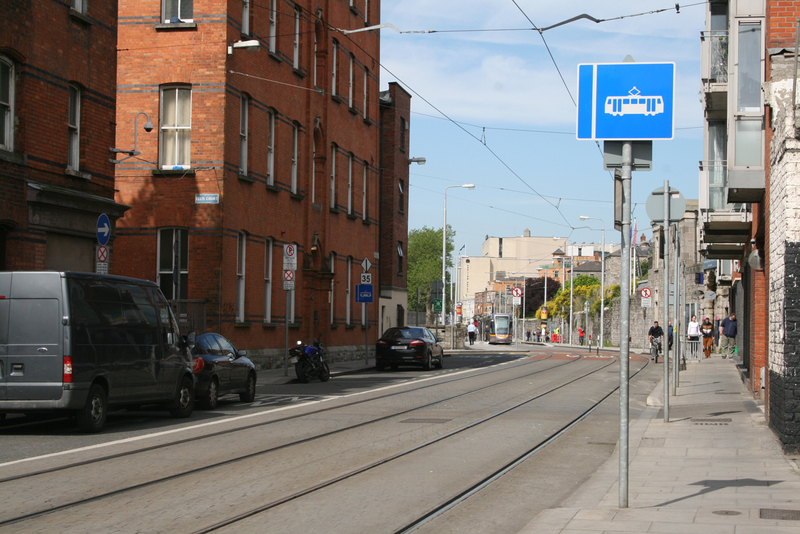 The Luas tracks and trams cross many road junctions used by motorists. In all there are 62 Junctions controlled by Traffic Lights on the Luas lines; 48 on the Luas Red Line and 14 on the Luas Green Line. There are also lots of other junctions with Stop Signs. Always cross directly across the junction. A lot of the Luas Green Line reuses an old Railway line so trams on the Luas Green Line do not share as many roads and junctions with vehicles as trams on the Red Line. 5.5km of the Luas Red Line runs through busy city centre streets; there are 16 Junctions controlled by Traffic Lights between Heuston and Connolly stops. There are over 37km of Luas tram lines in Dublin.Together Junctions and Shared Tramways make up 9% of the Luas tracks. In a limited number of locations Luas tracks are located in Shared Tramways which are used by trams, vehicles and cyclists. The easiest way to identify Shared Tramways is checking traffic signage and road markings. As a rule of thumb if you are not 100% sure you can drive there then don't. Never allow anything to distract you while driving. If you have any questions please contact Luas Customer Care on LoCall 1850 300 604 or by email info@luas.ie.